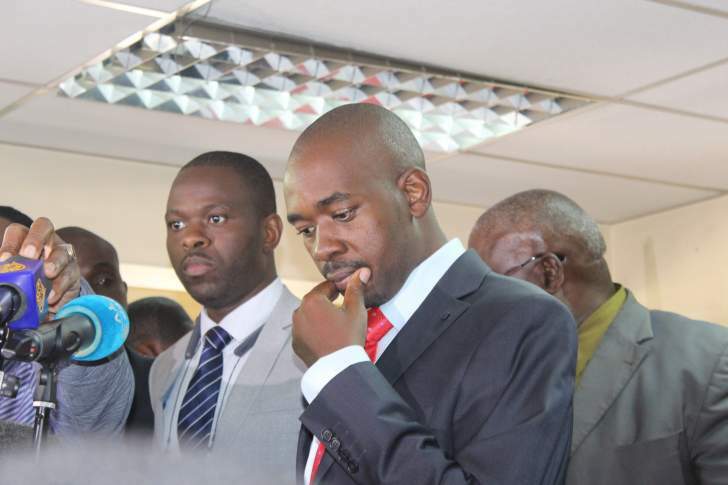 With the much anticipated MDC Alliance congress slated for next year around the corner, with every position in the presidium hitherto believed to have been up for grabs, national organising secretary Amos Chibaya has slammed the door shut on wannabe presidents, saying Nelson Chamisa will go uncontested. Chibaya's stunning utterances could put him on a collision course with secretary general Douglas Mwonzora and vice president Elias Mudzuri who are both said to be pushing for every post to be contested as per the party's democratic tenets. Two factions, one aligned to Chamisa and the other to Mwonzora, have emerged with Chamisa's faction, however, said to be enjoying the support of most national leaders while Mwonzora is said to be working harder to get support from the leadership of the provinces. At an integration meeting held at the party's provincial offices in Rhodene last weekend, Chibaya said since the MDC brand was formed in 1999 under the leadership of the late Morgan Tsvangirai, they never had a presidential ballot during congresses. "MDC is a brand and since we formed the party in 1999, we never had a presidential ballot at the congress. This is because our leader, the late Morgan Tsvangirai was the face of that brand. "Now that president Chamisa was left wearing Tsvangirai's shoes, we will not have a presidential ballot at congress. Chamisa has taken over as the face of the MDC brand," said Chibaya. He said the party will take stern measures against members who may dare campaign for positions at congress. "We hear people are now jostling for positions at congress and many have already abandoned the party's direction. Right now, we are dealing with a stolen election yet others are already thinking of congress. "We will deal with all those campaigning. No one is allowed to campaign and all those who wish to retain their current positions will be judged on how they performed," said Chibaya. Factional battles have already begun in Masvingo with Tongai Matutu's faction aligning itsels to Chamisa while the James Gumbi faction is alleged to be strongly aligned to Mwonzora. There were skirmishes outside the party's offices with the Matutu and Gumbi factions coming closer to a fist fight at the weekend. The Matutu sympathisers could be heard shouting that they do not want Gumbi anymore because he had 'let down the province' in the July 30 elections through imposition of candidates. National chairperson, Thabitha Khumalo lashed out at functionaries saying the party should focus on defending the people's vote which she said was stolen by Zanu PF. "We will not tolerate people who will be used or bought with money. How can people outside trust us when we are busy fighting ourselves? We need to provide leadership to our people who are in serious trouble under an illegitimate government. "We are now integrating members of other opposition parties and if they see us fighting, what would they say? Let us set our eyes on the ball," said Khumalo. The meeting was graced by members who broke ranks with National People's Party (NPP) among them Dzikamai Mavhaire and Jeffryson Chitando as well as People's Democratic Party (PDP) and MDC-N members. Khumalo urged members to embrace those coming on board and work together to proffer solutions to the struggling Zimbabweans.